DISCLAIMER: 1. This pie does not contain actual crack. 2. This picture does not do it justice. A few weeks ago my friend Carly asked if I had ever tasted Crack Pie. Crack Pie? Huh? She then explained it’s some crazy addictive pie she’d heard about, and that you can buy it online from Momofuku Milk Bar for $44. Yes, $44. As fate would have it, the LA Times ran an article about the pie the very next day, and included in the article was the recipe. I promised Carly I would make it. So when I got invited to a friend’s Oscar party, I figured hey, why not try out the Crack Pie? Since the recipe yields two pies, I had grand plans of tasting one pie then freezing the rest of it so Carly could try it, and bringing the other pie to the party. Of course, my oven had other plans and I burned the first pie beyond repair (totally my fault, I set the oven incorrectly). This meant I only had one pie to work with and I would be bringing something I had never tasted to the party. To make matters worse, I read tons of reviews and everyone said their pies were jiggily and oozing and undercooked so I cooked mine about 10 minutes longer, and when I took it out of the oven the top was cracked which made me fairly certain I had over-baked it. However, the final step of the recipe calls for a light (I have a heavy hand apparently) dusting of powdered sugar which covered the ugly exterior and no one was ever the wiser. Fortunately, it was a huge hit. As in, OMG WHAT IS THIS PIE? IT IS SOOOOOOOOOO GOOD! 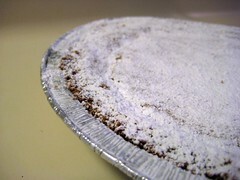 and I CAN SEE WHY IT’S CALLED CRACK PIE, IT’S BETTER THAN CRACK (if you say so). The pie is crazy rich with a caramel flavor and gooey interior. A slice held its shape for about .23 seconds before becoming an oozy mess on a plate, but no one cared. It was that good. In fact, it’s a “I’d eat this straight from the fridge with a spoon my fingers kind of good. Although, I have to admit, I don’t think I’d pay $44 for it. Some notes: 1. I hate “scant” measurements and used the weight measurements whenever possible. 2. My pies felt super jiggily after taking them out of the oven at the lower temp, so I baked them for an additional 10 minutes, which I’m still not sure they needed. In a medium bowl, sift together the flour, baking powder, baking soda and salt. Spread the mixture onto a 9-inch-by-13-inch baking sheet and bake until golden brown and set, about 20 minutes. Remove from heat and cool to the touch on a rack. Crumble the cooled cookie to use in the crust. Bake the pies, one at a time, for 15 minutes, then reduce the heat to 325 degrees and bake until the filling is slightly jiggly and golden brown (similar to a pecan pie), about 10 minutes. Remove the pies and cool on a rack. Recipe from the LA Times. I’ve been reading about this all over the web, but $44 for a pie??? Ohhh I’m sooo glad you made this! I’ve been hearing about this pie for awhile now and have the recipe bookmarked to make sometime soon! I’m glad it turned out so delicious. I can’t wait to make it! And thanks again for the cookbook!!! I love it and can’t wait for the opportunity to bake someone a cake!!!! Based on your endorsement I kind of want to ditch the crust and use it as a topping for ice cream. If it is that oozy and delicious with a little bit of baking, then I’m sure it would be even better on top of some brown sugar or vanilla ice cream. Sounds kind of like pecan pie, no pecans? Adding this to me ‘to bake’ list! Wow there’s surprisingly not much to it! @Seanna Lea, The crust is amazing as well!! @Ammy, yeah, it is similar to a pecan pie sans the pecans. @justJENN, fairly simple, just time consuming. @cheryl and Dawn, no doubt!! When my husband and I went to New York this past December, I made it a point to go try the crack pie at Momofuku. While their service was TERRRRRRRIBLE, the pie was pretty good. The slice was super small, and at $5 a slice, it didn’t seem worth it to me in the end. However, my husband and I both agreed that it tastes JUST like Sylvanas, a super rich Filipino dessert – sooo good! I made this pie for the family today. You are right about the “scant” measurements. They were a bit of a pain. I was concerned about the runniness that you described. I have had this problem with crème brulee. The solution to my runny crème brulee problem was to whisk the egg yolks for about 5 minutes until the yolks are smooth and bright yellow. I decided to try this method for the pies. I don’t know what the consistency is like following the original instructions. However, my pies were not runny at all. The slices held their shape after cutting. I cooked one pie for 15 minutes at 325 and the other for 10 minutes at 325. I found that the consistency of the “10 minute pie” was better. It was also easier to slice. Just my .02 cents. Looking forward to new recipes! Made this today, friends enjoyed it even though I messed the heavy cream up. Served cold, it was tasty but warms seems like it would be super duper delicious. I was not sure what milk powder is? Is that just powdered milk? Henry’s sells it in bulk. You can buy the amount that you need. @barbara – Yeah, milk powder and powdered milk are the same thing. Let me know how it turns out! thanks. Just got back from the store with the ing. and just about to bake. Will let you know.